This entry was posted in Steelers 2018 Season and tagged Cameron Heyward, James Conner, Jaylen Samuels, Kevin Colbert, Le'Veon Bell, Mike Tomlin, Pittsburgh Steelers, Steelers running game, Stevan Ridley. Bookmark the permalink. Whats done is done not a team player team galvanized and more of team without him. Not a big play ,player behind another offensive line might become very average . I agree, it is good that the Steelers can get this behind them. And I think it may have had a unifying effect too. 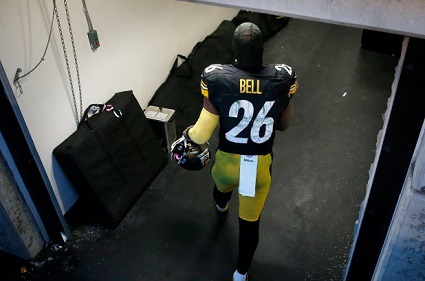 However, I think we have different views on Le’Veon Bell’s ability. This is a guy who broke records that neither John Henry Johnson, Franco Harris, or Jerome Bettis could touch. With that said, how much tread is left on his tires? That’s I thought that the franchise tag was probably best for both parties.